Article by Christopher Galley - It was a quick turnaround to make this year’s Mama Tried show. I had less than two weeks between shows, and I had some work to do. I sold a large painting at the close of Cheap Thrills in Asbury Park, NJ. This event has definitely become the kick-off to the East Coast chopper season and gets bigger and better every year. My goal was to put something new together before heading to Milwaukee. Usually it takes me three to four weeks to pull together a painting. With Mama Tried fast approaching, I bid sleep a fond farewell and headed back to the studio. It was definitely worth it. I wouldn’t be showing up to Milwaukee empty-handed. Our trip started with a runthrough to our friendly neighbors to the north, Canada, on our way to Detroit. Luckily, the border guard was an art fan and we were allowed into the country with only light questioning. I was honestly surprised we were allowed entry after I stumbled through his question about what my art actually was. I guess I have a trustworthy face….our destination at the end of Day 1 was just outside of Detroit at the home of our friends Greg and Gabi. 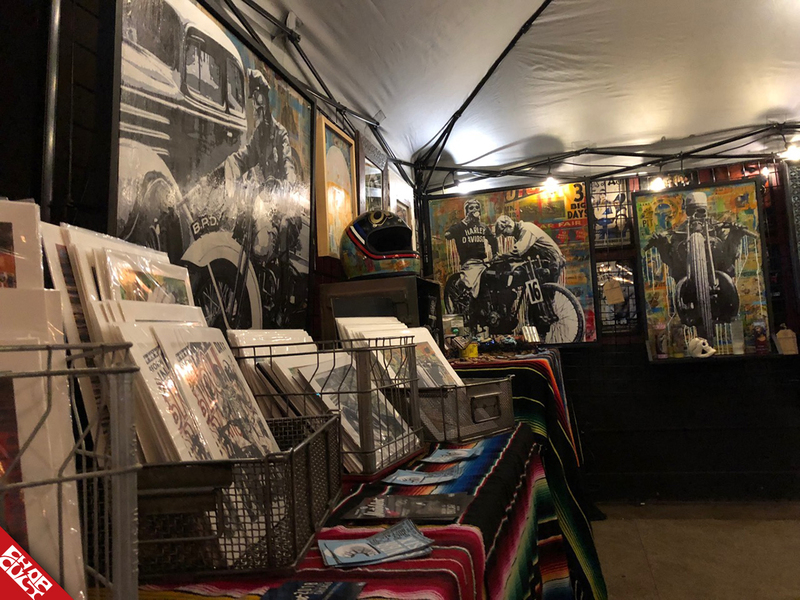 They are familiar faces on the custom motorcycle scene, and two of the most welcoming and kind-hearted people you could ever have the good fortune of meeting. Our night included dinner at a Japanese restaurant endorsed by none other than Star Trek’s George Takei (so you know it was good!) 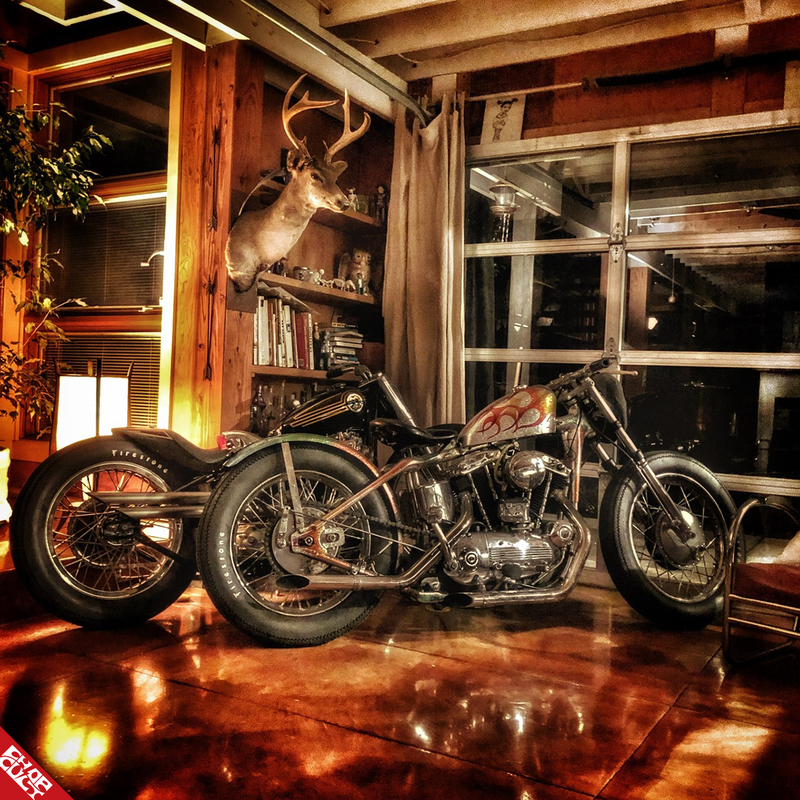 and a lot of me drooling over their living room decorations, a 1975 HD Ironhead that is absolutely bathed in metal flake and the legendary “Papa Glide” custom. The next morning got us on the road to Milwaukee early, as Greg was off to pick up legendary racer Art Farley’s 1939 HD WLDR race bike. Art passed away earlier this year after a stoic battle with cancer. Greg was traveling to Mama Tried with Art’s wife Lynn and their longtime friend Joe. Along with the bike, Lynn brought a display of Art’s racing leathers and photos of him in action. 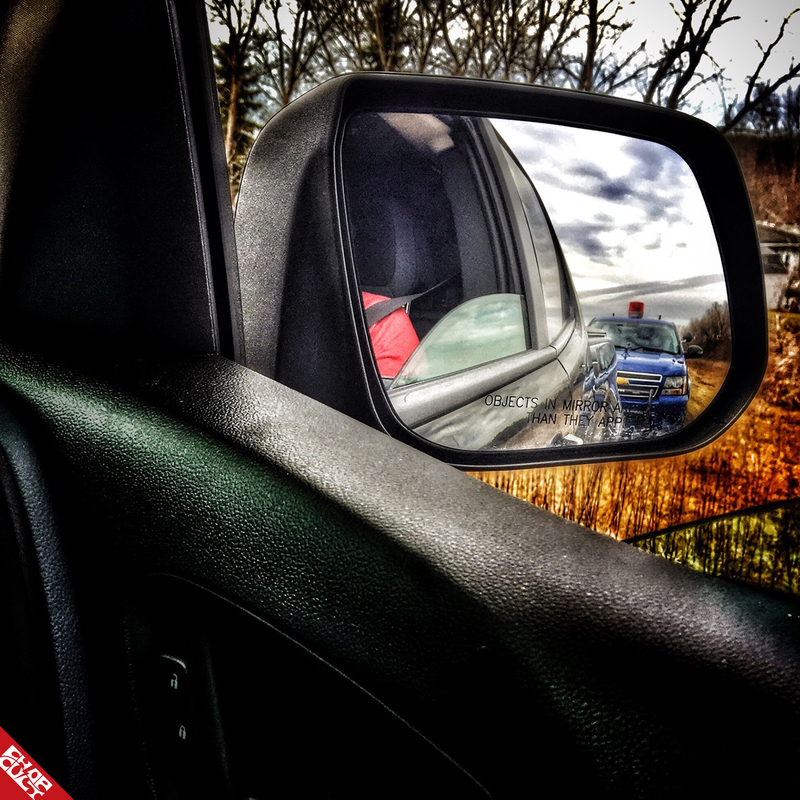 Our trip across Michigan included a chance encounter with a state trooper, who was quick to offer some helpful driving advice. Another short conversation about what I make got us back on the road with only a friendly warning. All signs were pointing to this being a great weekend! We rolled into Milwaukee a few hours ahead of bike night at the Harley-Davidson Museum. We easily killed a few hours in an epic, three-story antique shop. I’m always on the lookout for old print materials to include in my collages. My “knucklehead dreams” kept me from buying a rad AMF era HD snowsuit. I did take home a 1973 road map of Alaska and a vintage Wisconsin license plate. I’ve collected license plates for as long as I can remember. I make it a mission to collect a plate from every state or country I visit. Next up was the Harley-Davidson Museum. If you haven’t been yet, do yourself the favor and make the pilgrimage. The collection contained within the walls is nothing short of comprehensive. The bikes are definitely overwhelming. You can’t see them all in one trip. As soon as you start to hone in on something amazing, your moto-ADHD will pull you in another direction. The museum is broken up by time period, with just about every year of the Motor Company’s wares on display. The collection also includes the coveted “Serial Number One”. 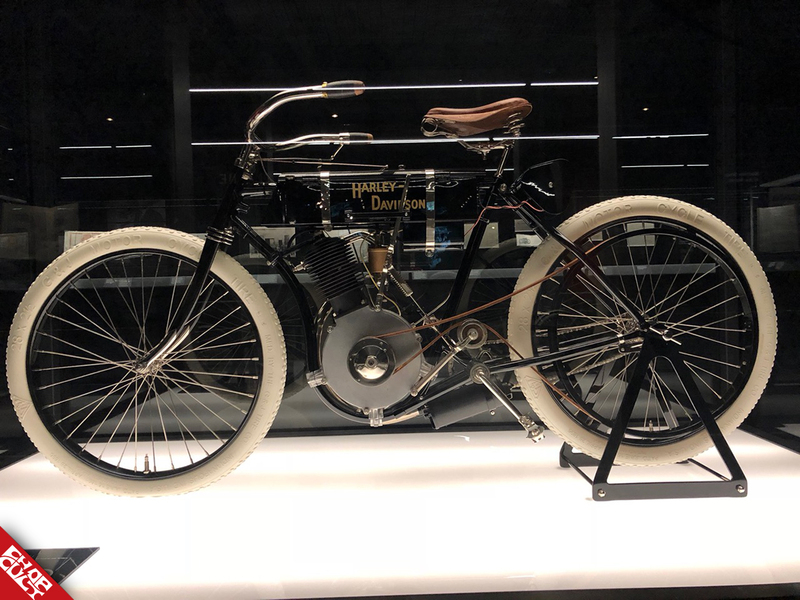 This almost mythical machine has created debate for years as to whether or not it is truly the first Harley-Davidson. 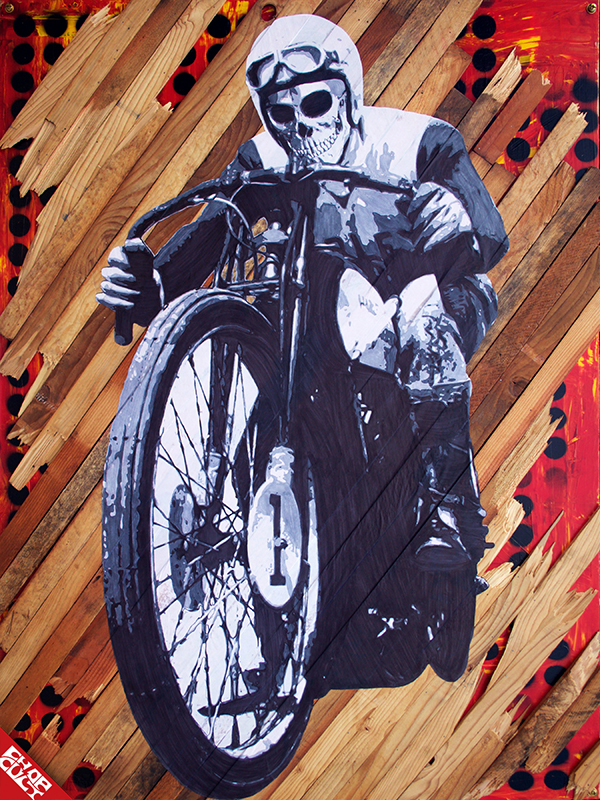 The collection is bolstered by a stunning array of print advertising that encapsulates the history of motorcycling around the world. 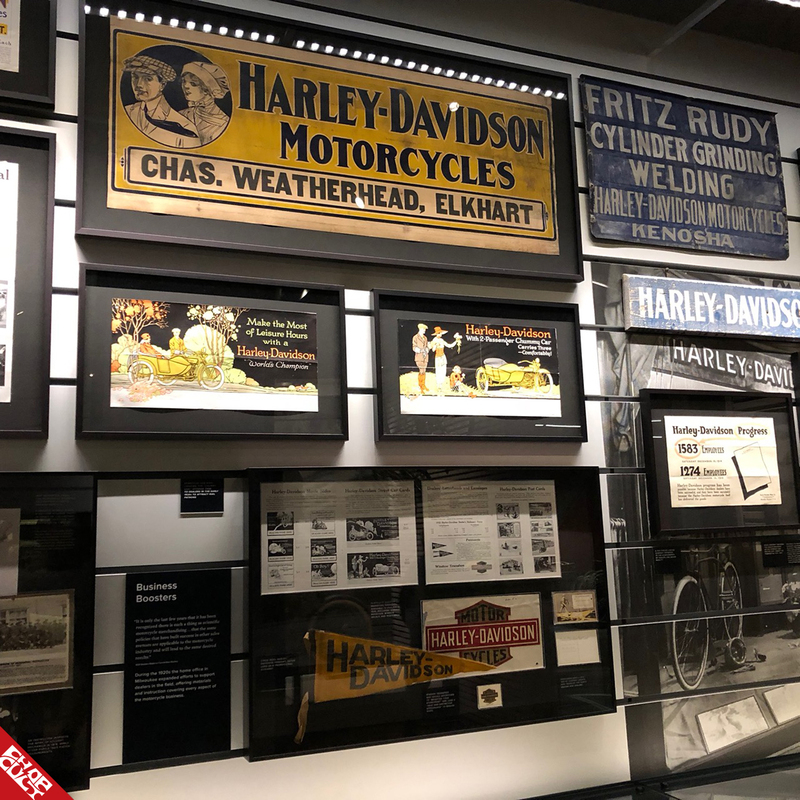 The museum also stylistically branches out: The first floor showcases Harley-Davidson’s range of customization, from early bobbers to an amazing double Knucklehead dubbed “King Kong”. Finally, the museum displayed HD’s rich racing history. The displays spanned from the beach to the track. Just about everything is there. Some highlights included an iconic Knucklehead streamliner and an inspiring board track racing display. With so much to see inside the museum, we managed to pull ourselves away as more bikes called our attention back outside. It was bike night, and despite the frigid temperatures of Milwaukee in February, the lot was full. Race bikes fresh from practice laps at the BMO Harris Bradley Center in anticipation of Flat Out Friday were in abundance. 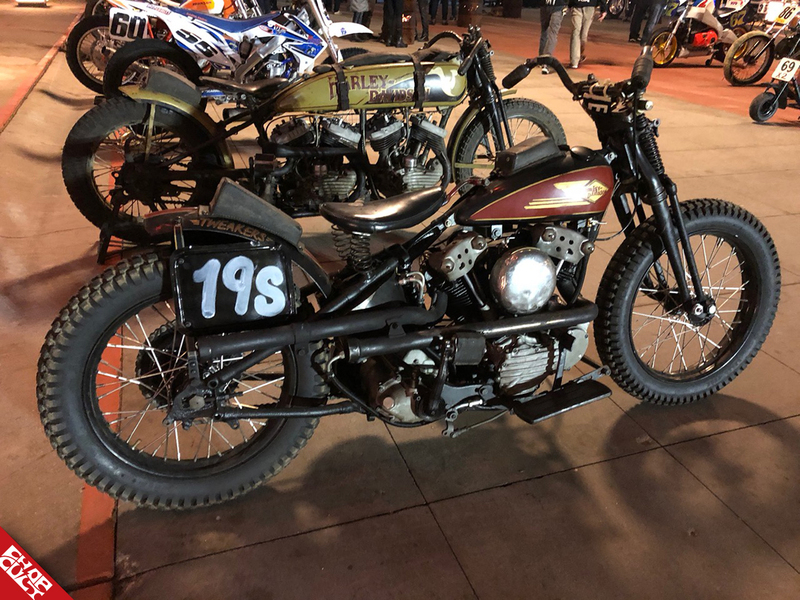 Expert, Hooligan, and Vintage classes were all represented at bike night. With all of these impressive machines on hand, it’s hard to believe, but the mini-bikes stole the show. The minis were running a small flat track style course right on the concourse between the museum and the bar. The race through the crowd to the starting line was almost as entertaining as the race itself! Next, we took the short walk over to Fuel Café. Fuel was overflowing with spectators, builders, collectors, painters, and photographers. You couldn’t turn around without bumping into a friend in town for the show. Mama Tried had pulled in people from all over the United States. We hadn’t even made it to the bar before a familiar rumble parted the sea of humanity. Led by the ubiquitous white jumpsuit of a Flat Out Friday track attendant, the mini-bikes were here! In no time flat, a lane was cleared and racing around the bar ensued! Not to be outdone, the Rusty Butcher snaked through the crowd on his hooligan racer, followed closely by Kendall and his PBR shovel chop. You can’t get more Milwaukee than a PBR chopper! Tire smoke filled the bar as the roar or the engines were drowned out by the excitement of the crowd. I definitely still have tire rubber in the cuffs of my jeans. As in any arms race, a spectacle like this was sure to be challenged. As I made my way to the outdoor patio in search of fresh air, another cheer drowned out the bar’s sound system. I turned to find a mini-bike being hoisted onto the bar. As the rider climbed aboard, I was sure a bar top burnout was eminent. I couldn’t have been more wrong. He waved his arm wildly to clear a path and took off down the length of the bar, launching himself through the crowd and out the front door. I’m pretty sure the daring feat resulted in a cracked case, as the spent bike drained its contents of oil onto the patio. It was a fitting close to our first night at Mama Tried. Flat Out Friday kicked off later that night. This was to be my wife’s first flat track viewing experience. She was, adamantly, a reluctant spectator. I assured her that if she gave it a chance, she would have a great time. Our seats overlooked the staging area for the racers as they waited anxiously for their time on the Dr. Pepper syrup covered concrete track. I couldn’t have asked for a better seat for a new fan. The anticipation and energy of the pits was contagious. As the heat races kicked off, my wife was cheering on friends and cringing as riders took corners too aggressively and found themselves sliding into the hay bales surrounding the track. The races were tight all night long as the short track and skill level of the racers didn’t provide much room for a mistake. 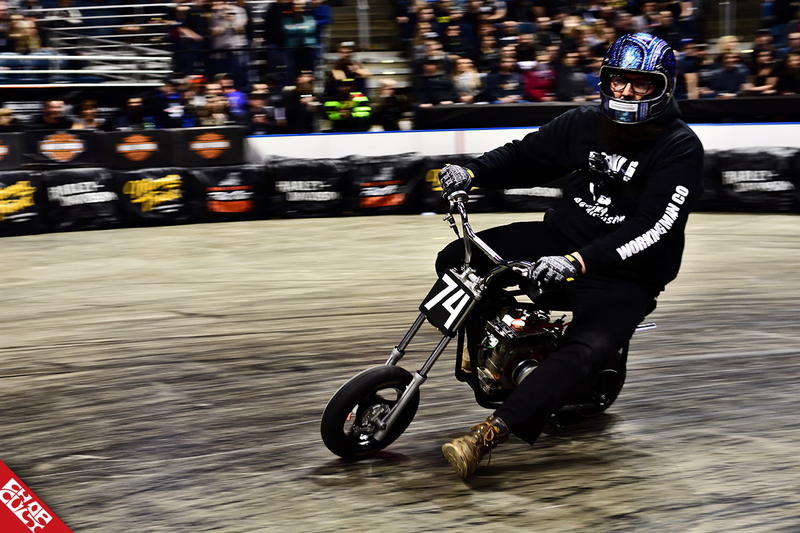 The hooligan class grabbed the crowd’s attention as the big bikes roared around the arena. The expert class proved to be the most intense race of the night with multiple lead changes as racers pulled for the checkered flag, and also offered the biggest purse of the night. The most entertaining race of the night went to the Goofball/Inappropriate class. Choppers, a Goldwing, and a Larry Enticer wheeled snowmobile took to the track. The win went to the siren equipped Goldwing straight out of a C.H.I.P.’s episode filmed by John Waters. The talented rider’s shorts and mustache definitely lived up to the “Inappropriate” class designation. We arrived back at the Eagles Club three hours before Saturday morning’s show opening. The venue was buzzing, as vendors were moving in and setting up. The last of the bikes were lining up and making their way up the freight elevator. The most impressive thing was that even through we were there three hours early, we had to walk past an almost block long line of eager show attendees. We set up with our friends First Mfg. and Vanilla Cycles in a downstairs bar. We couldn’t have asked for better roommates. To top it off, Ryan from Vanilla Cycles classic 1947 Knucklehead, built by Kenny Slaughter, was a feature bike in this years show. As the 10:00 a.m. hour struck, the sea of humanity and motorcycles that is Mama Tried was officially underway. I’ve had the good fortune to be involved with a number of shows across the country over the last few years. Mama Tried, without a doubt, drew the largest crowd. It was only a matter of minutes before it felt like every inch of all three floors was filled with people. I made it a point to ask the people who stopped by my booth where they were from. Wisconsinites were out in force for sure, but Mama Tried drew people from all over the country. The winner of the furthest traveled show attendee award went to July and Kai. They had traveled all the way from jolly old England. I was glad I had an opportunity to talk with them. It turned out I wasn’t the only one with that bright idea. As I made my way to the ballroom floor early Sunday morning I found it full of builders, photographers, and vendors. Everyone was itching to take in the history and innovation the showroom floor offered. The ballroom was nothing short of overwhelming. It felt like you could find every incarnation of motorcycle there. 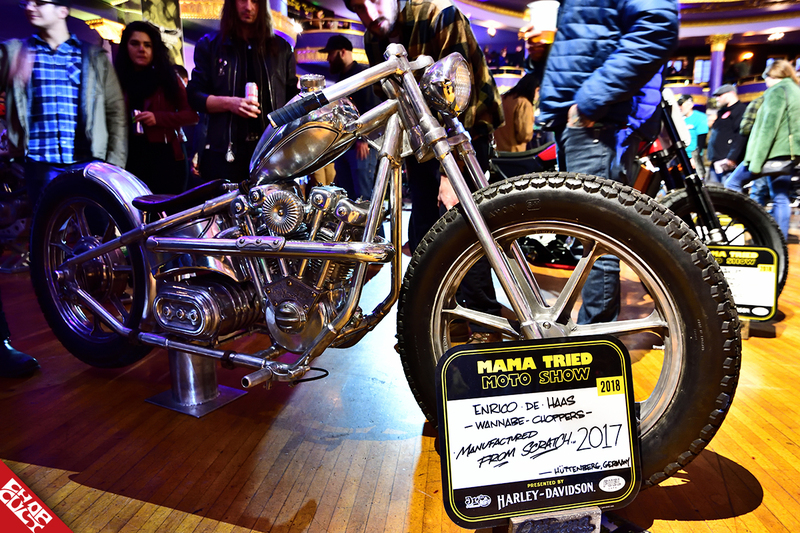 From Gene Payne’s 1953 HD KRTT (which was one of only 13 built) decked out in paint and wear respective of it’s racing history, to the all-electric chopper built by Ricky De Haas of Germany, demonstrating the newest in technology. Ricky’s bike weighs in at only 170 pounds! Mama Tried was the last chance to see the bike in the United States before it heads back across the ocean. I was very glad I had the opportunity to spend some time admiring the craftsmanship of it. Another attention grabber was the Zonkern. 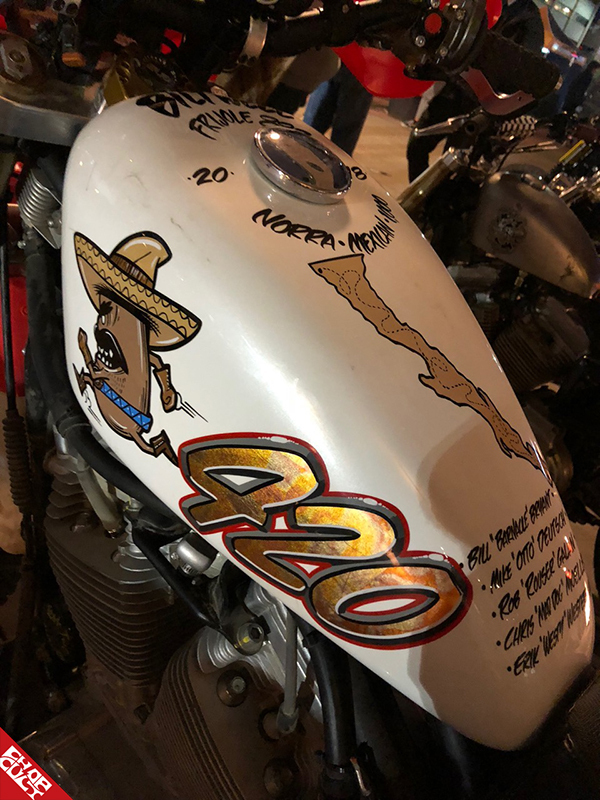 This sheet metal masterpiece started life as a 1997 Buell. Builder Yuichi Yoshizawa traveled from Japan for the show. Alex Maslin also contributed a Buell to the Mama Tried floor. His 2002 Buell Blast looked like something out of the latest Blade Runner movie. The aggressive stance and emphasis on exposed mechanics contrasted beautifully with the Zonkern. It looked like a blast to ride! 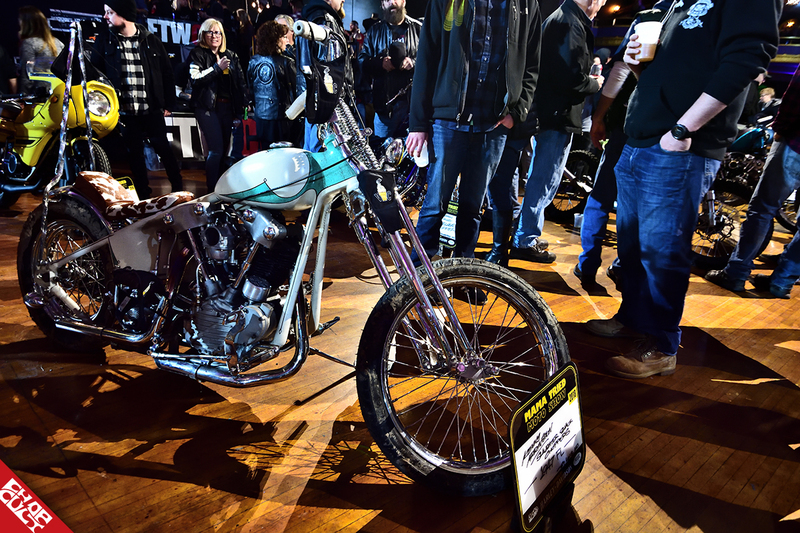 Billy Favata’s 1965 Triumph T120C demonstrated the proper stance of a classic show chopper, while Ben Hittle’s 1969 Shovelhead was everything a purpose-built chop should be. Speaking of purpose-built, Otto from Biltwell brought the Frijole 883 Baja 1000 racer to Milwaukee. This machine will be tearing up the Mexican dessert this November. The Frijole was still wearing a nice layer of sand and mud from testing in the California desert. 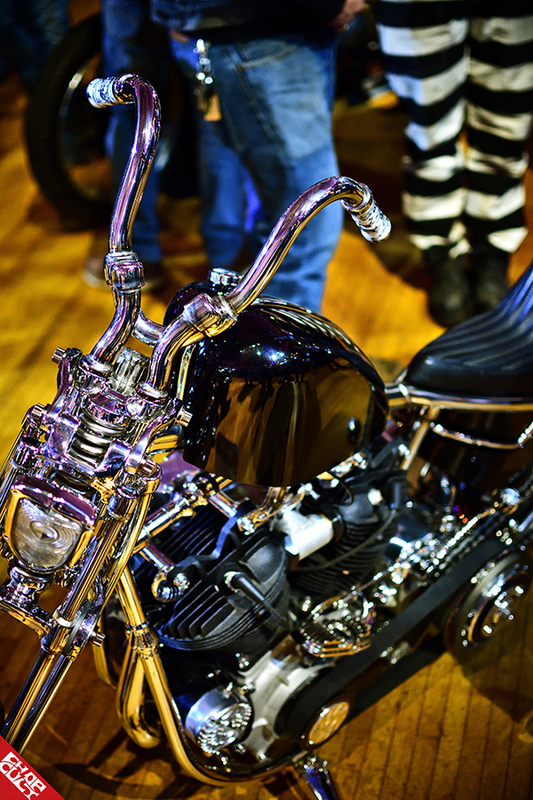 Mike Rabideau’s 1981 Shovelhead showcased his attention to detail as well as his fabrication skills. This bike drew a crowd all weekend, I was glad to sneak in on Sunday morning to finally get an up close look at it. While we’re on the topic of fabrication, Christian Newman brought his amazing Knucklehead chopper to Mama Tried. Outside of the power plant and the tire rubber, I think Christian hand-fabricated every part of this bike. As Sunday high noon rolled in, the crowds started toward the door as Mama Tried 2018 drew to a close. I was starting to load artwork back into my truck when my wife Jo came to the parking lot to tell me I was needed back inside. A couple from Illinois, who were at the show on Saturday, was back to pick up a painting they had to have. 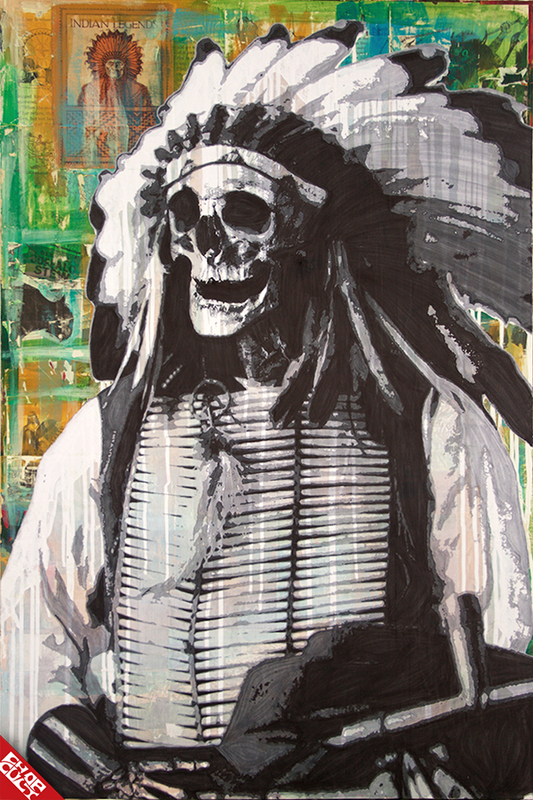 They decided to take home my painting “Paha Sapa”, a portrait of Sioux Chief Red Cloud. I couldn’t have planned a better end to the show. Mama Tried gave us a chance to reconnect with old friends as well as meet some new ones. I think this is why Mama Tried has become such a successful event. When you establish a high standard for craftsmanship and mix in the welcoming Midwestern attitude, you’ve got a winning recipe. Thanks for the good times Milwaukee, we’ll see you again soon! Videos borrowed from S&S Cycle, Inc. Please support the Harley-Davidson Museum and Flat Out Friday.